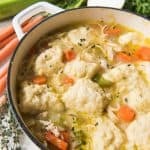 My favorite soup from my childhood, Chicken Noodle & Dumpling Soup is made with homemade egg noodles, super easy dumplings from scratch, and loaded with shredded chicken, carrots, cabbage, celery, and onions! It's comfort food at it's best! Pour the chicken broth into a large heavy pot or dutch oven over medium-high heat. Add the carrots, celery, onion, and cabbage to chicken broth and season with salt, pepper, and thyme and bring to a boil, then reduce heat to medium-low. Simmer 15-20 minutes, until the vegetables are tender. Stir in the shredded, cooked chicken. Add the fresh egg noodles by dropping them in a handful at a time and stirring so they don't clump together. Add the dumplings at the same time by dropping tablespoonfuls on top of the simmering soup. Cover and cook for 5 minutes until the dumplings are cooked through and no longer doughy inside. To make the noodles, pulse flour and salt in a food processor. Add olive oil and pulse. Add egg and pulse to combine. Add the milk, one tablespoon at a time, and pulse just until combined and starting to clump a bit. Dump the egg noodle dough onto a clean counter and knead a few times to bring it together in one clump, then cover with plastic wrap and let rest for 20 minutes or longer. Roll out very thin on a well-floured surface, then cut into thin, short strips using a pizza cutter or sharp knife. Combine all dumpling ingredients together in a medium bowl by stirring with a fork just until moistened.